I’ve talked a bit about photographers’ frustrations, but one of the most annoying has got to be the “No Photos Allowed” sign. I can accept this in some of the most sensitive locations, such as Scrovegni Chapel (where you have to wait 20 minutes to be “dehumidified” while watching an interesting video, before being allowed into the chapel itself to view the Giotto frescos). And I completely understand and support the no flash policy at most locations. However, in many places it seems like it’s just a way to try to encourage you to by the guide book or postcards if you want to have a visual reminder. A lot of churches had a no photo policy, but didn’t seem too bothered, others were much stricter in its application. 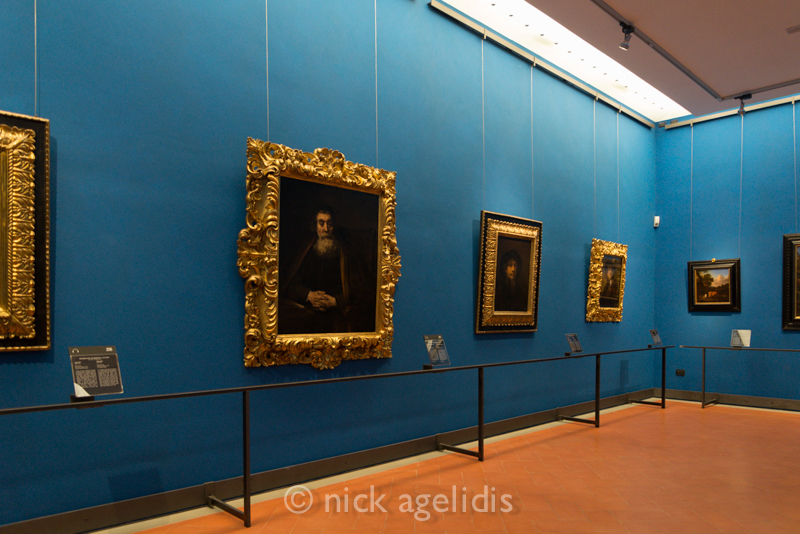 The most frustrating for me was the Accademia in Florence, which houses Michelangelo’s David. Now, I wasn’t particularly keen to get a photo of David, but by some fortunate timing, I was the first one in the museum and for a couple of minutes I was the only person in the room with David (who normally is surrounded by a crowd 20 deep). Well, I was the only visitor that is – there were also three museum guards to make sure no photos were taken. It would have been nice to have recorded the rare event of being there just with David, and for a minute I debated asking one of the guards to take a picture of the two of us, but in the end I thought it was pointless. Here’s a photo of the line waiting to get into see David as I was leaving. There is a replica of David in the Piazza della Signoria, which has been photographed a million times. 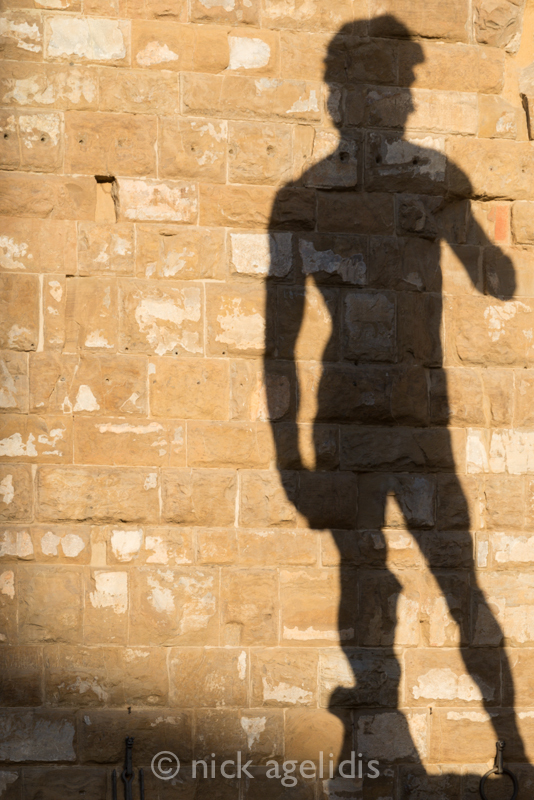 When I was there, he was casting quite a distinctive shadow, which I thought was an interesting alternative. The first is one of many monk’s cells in the Convento di San Marco in Florence with frescoes by Fra Angelico; the second is one of the long corridors in the main floor of the Uffizi gallery that houses masterpieces of Italian art; the floor below is relegated to “Artists from other countries” and is much less visited – the third photo is from an empty room with four lonely but well known Rembrandts peering out from the wall; the fourth is the ceiling of the Scuola San Rocco in Venice, also known as “Tintoretto’s Sistine Chapel”. They’re not great photos, but I took them in a rebellious mood – especially given the fairly hefty entrance fees I had to pay for each one.